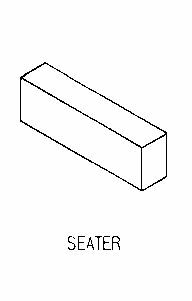 Brush Seaters - Selection guide at the bottom of this page. 0.125" x 0.250" x 4.750"
0.250" x 0.250" x 4.750"
0.250" x 0.375" x 4.750"
0.250" x 0.500" x 4.750"
0.250" x 0.750" x 4.750"
0.375" x 0.375" x 4.750"
0.375" x 0.500" x 4.750"
0.500" x 0.500" x 4.750"
0.500" x 0.750" x 4.750"
0.500" x 1.000" x 4.750"
0.625" x 0.750" x 4.750"
0.625" x 1.125" x 4.750"
0.625" x 1.250" x 4.750"
1.000" x 1.000" x 4.750"
1.000" x 2.000" x 4.750"
1.125" x 1.250" x 4.750"
1.250" x 1.500" x 4.750"
1.250" x 2.000" x 4.750"
2.000" x 3.000" x 6.000"
2.000" x 3.000" x 8.000"
Brush Seaters: These stones are used to contour carbon brushes to the shape of the commutator. This reduces sparking and increases motor efficiency. For brush seating, select a stone that has a width equal to or slightly larger than the brushes that are to be seated. For commutator cleaning, select a stone that is about 3/4 the width of the commutator bar and a thickness that easily fits between the brush riggings. For slip rings, select a stone that is about 1/2" wider than the ring. ES: Extra Soft - For slip rings - Sizes bigger than 0.500 x 1.000"
FH: Fine Hard - Small motors: Vacuum cleaners, fan motors, automibile generators, etc. MS: Medium Soft - General purpose large motors - Sizes bigger than 0.250 x 0.750"